I can not believe we are still being plagued by May water. I know everything has been late this year, but even so, it should have cleared up weeks ago. Just as you think it is ending and the water is clearing, it returns again. Well I guess it is good for the Mackerel stocks as they have not been caught in the usual numbers, but I would love some for the BBQ. The Mackerel might not be showing properly, but the Smoothound are around in force. I thought my tally of 30 from Chesil last year was good. This year is even better. I have had all of mine on Peeler Crab, but that has not been the only successful bait. Ian Clark managed number of Smoothounds like the one above on Lugworm and Squid. Not so many Rays landed this weekend but a good few Plaice came from Abbotsbury. Chesil Beach forecast: Well it looks like no or very few Mackerel again until the May water finally clears, which should be soon. 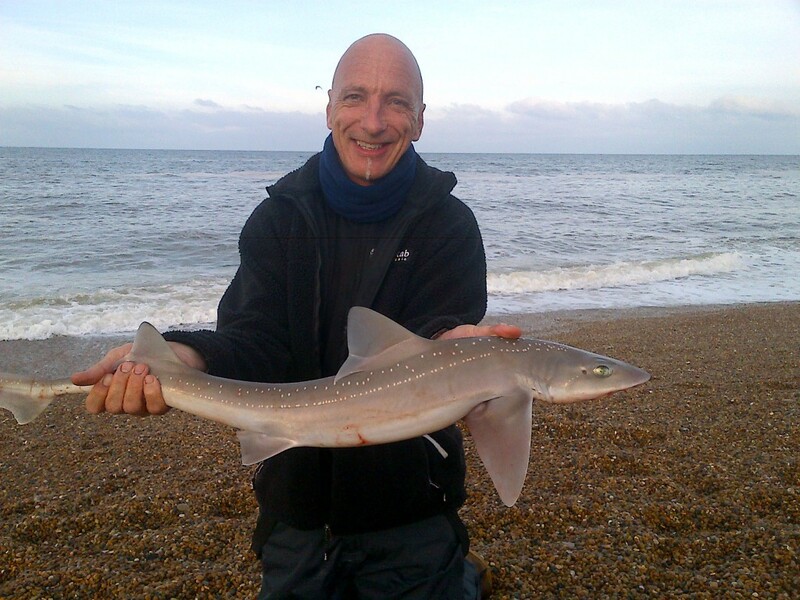 Plenty of Smoothound, Bass, Dabs and Plaice on the beach, with some Bream and Gurnard expected. Towards the Portland end of the beach the water is a bit clearer so it is possible that some mackerel could be found. Wrasse and Pollock are likely to feature as you get close to Chesil Cove. Portland: The water clarity should not effect the Wrasse fishing has been really good and I expect it to remain so. Lure fishing for Pollock, Mackerel and Garfish around the Bill has been very good, even during the day. As usual dawn and dusk are the best times of day for Pollock fishing. Portland Harbour: Lots of bait fish in the harbour with plenty of bird activity. I spotted lots of Mullet cruising around the Marina and down in Castletown. Expect Flounders and Bass along Hamm Beach and all the way towards the sailing centre at Castle Cove. They can normally be caught on Ragworm. Weymouth Bay: The Stone Pier has been a bit quite for the past couple of days. Hopefully now that the water has cleared the fishing will pick up again. The harbour is full of Mullet, mostly Thick Lipped, that can be caught on float fished bread. 5 Responses to "Catch report & fishing forecast for Dorset including Chesil Beach, Portland & Weymouth"
I fished checkpoint last Friday until Saturday morning, I had 5 smoothies to 6lb, a Huss of 6lb, lots out pout and a plaice of 2lb. All the hounds came on peeler and the place to black lug and squid. As did the Huss. Nice fishing Lee. I haven’t had a Huss for a couple of years now. It’s mackerel festival at Lyme Regis next week and although most of it is food based they still encourage fishing for them too. It will be a shame if we are still subject to May water. The May water really should be clear by then. I have been able to watch it today and it is much more patchy now. More clear patches than May water. Any chance you could specify chesil a bit clearer in you fishing reports… There’s quite a few miles difference between Portland end and Westbay end.